Only 1 hour drive from Sydney's Southern suburbs, and 15 mins south of Wollongong. 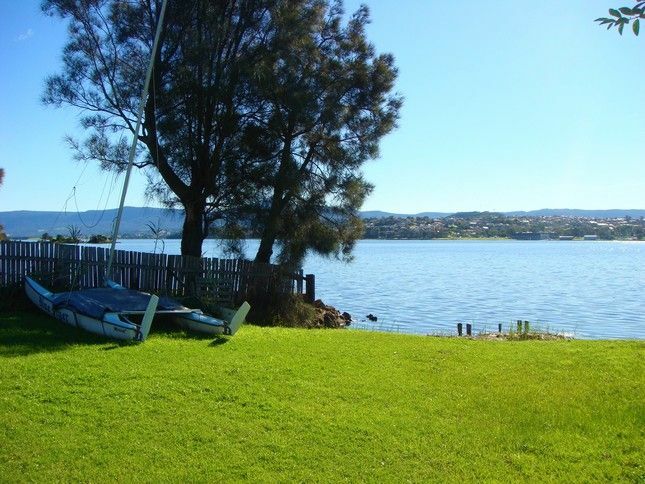 Located directly on Lake Illawarra, Lakeview Cottage is a modern 3 bedroom self contained brick waterfront cottage. * Fully equiped kitchen, TV, Gas BBQ, ensuite, washing machine, built in wardrobes, electric blankets and flame electric heater. A short drive to Warrawong shopping centre, Windang and Warilla beach and other local tourist attractions around the Illawarra district. Great surf inlets are nearby for safe swimming for children and play parks within walking distance. Come and relax for the weekend, unwind and watch the sunsets over the lake. Boats in photo are not included, but guest are welcome to bring their own kayak, canoe, or blow up boat for fun on the lake. * Movies / Shopping - Westfields Warrawong located a 2 min drive away. If the property is left in a state that requires additional cleaning, above the regular allowance cleaning time, then an additional cleaning fee will be charged. Linen is to be supplied by the tenant unless hire arrangements are made. Within 5-10 mins to many beaches along eastern coast, including Warilla, Port Kembla and Wollongong. The back deck overlooks the lake. Guest can bring their own canoe/kayaks and launch from the property. Property was really functional, and lovely view. It was a little small, but more than comfortably accommodated our family of four and the grandparents. House was very comfortable in a nice quiet location right on the water. Easy driving distance to shopping, dining etc. Would be prefect in summer months with the lake at your back door. A very relaxing position with plenty of sun and fantastic views. Super value property considering what you get for the price. Little lake beach was the best and only 5 mins drive. House was clean, welcoming and comfortable. We thoroughly enjoyed our stay. Will remember watching the lights dance over the lake of the evening whilst enjoying a cool drink. We stayed here with family over Christmas and it is a fabulous location, but the property itself is in dire need of some TLC. The main bedroom mattress is, to say the least, horrendous. It is "broken" right across the middle, and one side is lower by inches than the other. Bin it before you do someone serious damage to their back. Several light bulbs don't work. I know someone has to tell you this before they can be fixed, but, seriously, shouldn't your cleaner be checking them? On that note, the cleaner needs to do some serious spot cleaning of the walls, marked and dirty throughout. Also, the stove top hood is filthy, baked on grease and oil, the oven smells, and the shower in the ensuite was actually sticky with grime/soap scum. The whole property had had only the most cursory of cleaning. Additionally, what bright spark decided to house the three rubbish bins outside the main bedroom window? It was very hot, no aircon in the bedroom and we had the two minute windows open trying to get some air, but the stink from the bins made this impossible. I'd like to point out here too that we did not contribute to the foul mess in the bins in any way, taking ALL our rubbish off site to council bins. The three bins were all full and stinking when we arrived and remained so when we left. There was a note in the guest folder that it was up to "the guests" to place the bins out for collection, but no indication when that might be. Regardless, as they were full when we arrived I fail to see how it was our responsibility to put them out to be emptied, and there was no council collection while we were there at any rate. We stayed at Lakeside Cottage at Primbee during the school October school holidays. The house is very quiet , clean and tidy.